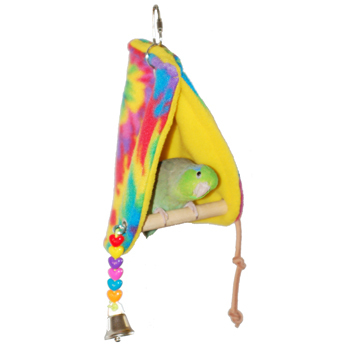 10 x 4.5 x 4 "
Your bird will snuggle right into this soft fleece tent with a built in perch. Tent, perch and toy all in one. 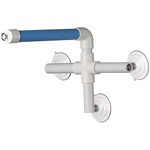 The dowel is 7/16" in diameter and 3.5" in length. 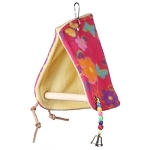 Perfect size for Parrotlets, Parakeets, and Lovebirds. Perch to inside peak height is 4", dowel dia is 7/16"
Open bottom tent design allows bird droppings to fall to bottom of the cage. 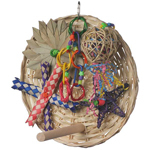 Includes knotted leather strip and a string of plastic beads to play with. 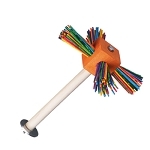 Q: Is this toy suitable for a male parakeet?